Ariston. And On. And On. Every so often a television advert comes along that hooks the nations interest. Â It might be because it’s particularly clever, or very funny, or perhaps it’s just so incredibly annoying that it somehow lodges in your mind and you just can’t shake the damn thing out. Â The Shake ‘n’ Vac advert is a particularly good example of this phenomenon, as are the adverts from the late 1980’s for Ariston home appliances. First of all take a piece of electro pop music that sounds like it’s been ripped straight out of an old computer game. Â Add in a few robotic sounding vocals and top it all off with some flying frozen chickens and a little animated guy made out of some fried eggs, sausages and a couple of cucumbers. Â For that final finishing touch end with a repeating phrase consisting of just two words – “and on”. Sounds pretty dreadful right? Â Well, yes, but so dreadful that you find yourself glued to the television. 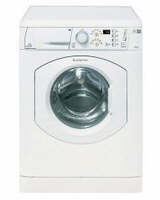 Â Whether Ariston sold more washing machines or not I have no idea, but it must have been fairly successful since they used variations on the “and on and on and on” theme for several years to follow. You surely can’t have failed to have heard by now that pop legend Michael JacksonÂ died of a heart attack yesterday afternoon, aged 50.Â Whilst he may have courted controversy quite frequently there is no denying that he leaves a massive legacy to the music industry, and can be rightly compared to such legends as Elvis Presley and John Lennon. Jackson was the seventh of nine children, and first shot to fame at the tender age of 11 with his brothers Jackie, Jermaine, Tito and MarlonÂ as a member of The Jackson 5.Â In 1971 he began his solo career but it was the eighties when he was at the height of his fame, with the release of albums such as Bad and Thriller, the latter of which is still the highest selling album of all time. He was not only a great singer and songwriter but also a fantastic dancer.Â His most often imitated dance step has to be the moonwalk, where he appeared to be walking forwards but moving backwards. 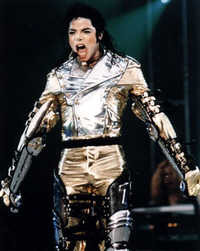 His eccentric behaviour earned him the nickname Wacko Jacko, and he is famous for having had a large amount of plastic surgery, most notably on his nose.Â His skin colour had also lightened over the years, which many claimed was due to this surgery but was in fact due to a disease called Vitiligo. His private life was drawn into question with the much publicised court trial for child molestation that was supposed to have occured at his home, the Neverland Ranch, which was more of an amusement park than a home with its fairground rides and roller coaster.Â Jackson was acquitted of all charges. His death comes just before he was due to perform a massive series of concerts at the O2 in London, which were set to begin in July and go on until 2010. 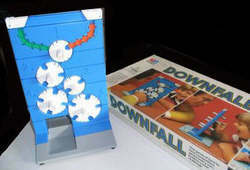 Downfall was one of those games that I always wanted, but no matter how much I hinted or wrote it on my Christmas list Santa somehow failed to bring me my own copy. Luckily a cousin of mine did get one for Christmas one year, so I did get to play it, but I liked it so much that just made me want my own one all the more. What I liked most about Downfall were the dials on the main playing board. Â These reminded me of the dials on safes that you always saw people twiddling, ear up to the door, when trying to rob millionaires on films (the safe was always hidden behind a picture for some reason). The idea in Downfall was to get all your coloured counters from the top of the playing board to the bottom by twisting the dials, which had little holes in them that could pick up the counters. Â In the meantime your opponent was trying to do the exact same thing on their side of the playing board. Players took it in turns to twist one of the dials, although you weren’t allowed to twist the dial your opponent had just twisted. Â As you twisted the holes in the dials past counters in other dials the counters would drop into the lower dial if two holes were alligned. There were some great TV shows in the 1980’s, and then there were some not so great ones too. Â Sadly falling into the latter category is the BBC show Captain Zep – Super Space Detective which ran for two series from 1983 to 1984. Â Actually, it may just have been called Captain Zep, but the theme music called him by this title so that’s what I’m going with. Being a bit of a sucker for anything set in space when I was a kid (and to be honest, I’m probably still a sucker for such fare today) it’s surprising I don’t remember Captain Zep more fondly. Â I certainly remember watching it, but only because there was nothing better on the other side (i.e. Children’s ITV). 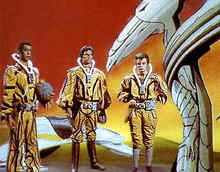 The idea behind the show was the titular Captain Zep and his cronies Jason Brown and Professors Spiro or Vana (depending on which series you were watching) zipped about the galaxy solving crimes. Â It wasn’t quite as passive as that though, as the programme was also part game show. Â The adventures of Zep and company were actually being used as training aids for young space detective recruits, in other words a studio audience who had all been forced to slick back their hair and don ridiculous jump suits. Think back about the band Bros. If you remember them then I bet you immediately think of Matt and Luke Goss, the blonde twins in ripped jeans and leather jackets. If you weren’t a fan then you may have forgotten that Bros actually consisted of a third member, that being Craig Logan. Well, I’d forgotten about him, anyway. 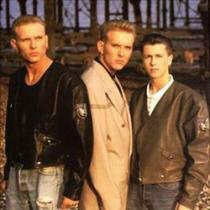 Bros formed in the late 1980’s, their first song being I Owe You Nothing in 1987, which only managed to chart at a measley position 80 in the UK charts. Their next release was When Will I Be Famous? the following year, which reached number two and started Bros mania among the teenage females of the country. Strangely enough, time has not treated this phenomenon well, as question a woman who was a Brosette in her youth today and she’ll probably look a little sheepish and try and skirt around the issue. A re-release of I Owe You Nothing followed, which topped the charts this time, and they also enjoyed top 5 success with Drop the Boy, I Quit and Cat Among the Pigeons, the latter of which was a bit slower in tempo to their other hits which were a bit more pop/rock in nature. It’s fair to say that most of their well known songs had a bit of an angry sounding edge to them, like they were annoyed that everyone was poking fun at them, which of course the male teenage population were. Master or Mistress of the Universe? If you weren’t already aware, She-Ra and He-Man were actually sister and brother. Twins, in fact. They were separated when merely babies, but given their super powers that was probably a good thing, since siblings are often prone to arguments with each other, and that could have been quite a mess. But what if they had grown up together and got into a fight over something? Perhaps He-Man pulled the head off She-Ra’s favourite doll, or She-Ra putting itching powder in He-Man’s furry pants? Let’s say they got into a little bit of an argument. Which of the pair of them would end up winning? In 1981 toy manufacturer Mattel released He-Man on an unsuspecting world and quickly convinced millions of young boys that a blonde haired muscle bound hero in furry pants was the business. Â The cartoon series was also popular but what annoyed the bosses was that they had only captured half the market. Â What about the girls? In an attempt to repeat the success of He-Man with the female half of the toy market, Mattel came up with She-Ra, Princess of Power, and in order to launch their new range of toys got Filmation, the company behind the He-Man cartoon, to make a series of animated adventures for She-Ra. 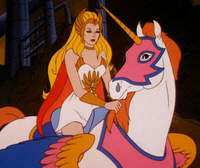 In order to tie the two product lines together She-Ra was supposed to be the twin sister of He-Man, although she lived on an entirely different world called Etheria (He-Man was from Eternia). Â Her name was Princess Adora, and the story was she was kidnapped as a baby, but since we’d never heard anything of her before in the He-Man stories this seems a little weak. Â Unsurprisingly, She-Ra used the template set up by He-Man, modified to appeal to girls. Like He-Man, She-Ra was armed with a magic sword, called the Sword of Protection, and also like her brother she could hold it aloft and say the magic phrase “By the honour of Greyskull” (note honour instead of power, He-Man’s version of the line) and be transformed from Princess Adora into She-Ra. Â When this happened, her faithful equine companion Spirit was transformed into a flying unicorn called Swift Wind. Â Of course, the horse could talk, just like Cringer/Battle Cat in He-Man.